Did Thorsten Heins elaborate the Z10's UK success? 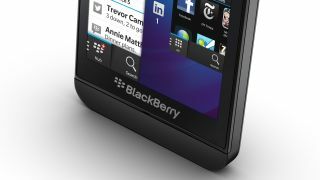 Mobile retailers in the UK have contradicted Thorsten Heins' claims that supplies of the white BlackBerry Z10 handset have already sold out, saying they have plenty of the BB10 handset in stock. The BlackBerry CEO came out all guns blazing earlier this week, saying the first BB10 handset had sold "beyond expectations" in the UK during the first few days of sale. In an interview, Heins asserted: "White is sold out already. The black is hard to stock up again. It's very encouraging." Sounds great. There's only one problem. It hasn't and it isn't. News outlets in the UK, perhaps a little surprised that BB10 was off to such a seemingly-unlikely whirlwind start, began calling around retailers to see if Heins' claim held water. Sadly, for Blackberry, it doesn't. Mobile News called Phones 4U's customer service line and two stores in Manchester and Leeds. All of which informed the site that the handset was in stock. Devices were ready for immediate collection, despite Heins boasting that the device was already unavailable, while another store claimed to have 'loads left'. The Telegraph also contacted Phones 4U - the exclusive supplier of the white Z10 in the UK - outlets in London, who also had 'plenty' of handsets available to anyone who wanted one. In further comments to the media made on Wednesday, Heins claimed that the Z10 had tripled the performance of any BlackBerry smartphone ever in the UK, during a first week on sale. While that may or may not be true (and it's difficult to tell), sold out it is not. BlackBerry is yet to officially comment on the reports, but this apparent spread of misinformation (or perhaps it's just a case of crossed wires?) by its supposedly pragmatic leader will come as an embarrassment.